Is It True You Cannot Have Flat Feet in the Military? Someone cannot serve in the U.S. military if they need to wear corrective footwear or experience chronic foot pain. Special therapeutic footwear can be difficult to maintain in battlefield scenarios. 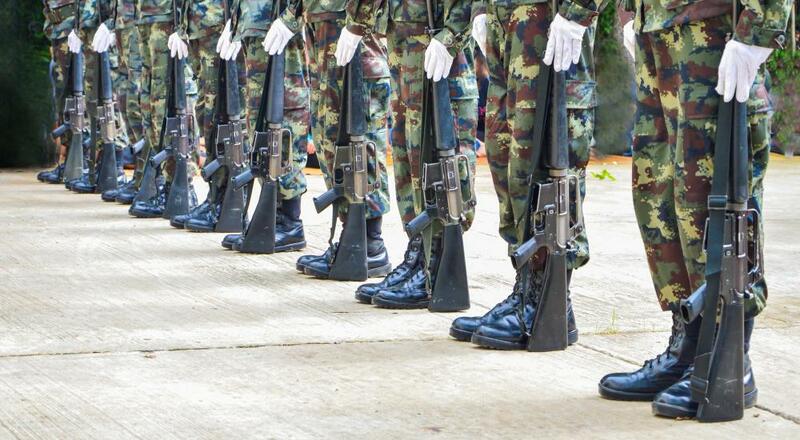 The severity of flat feet can determine whether someone will be allowed into the military. Regulations regarding physical requirements for admittance into the military typically depend on the laws of a particular country. In the US, for example, there are a number of different physical conditions that can affect a person’s eligibility to serve in the military. One of the most common subjects of debate with regard to this issue concerns whether someone can have flat feet in the military. Someone who has flat feet can serve in the military, although it depends on the severity of a person’s condition, and there are certain instances in which having flat feet will keep someone out of the military. A person has flat feet when the arches of his feet flatten out rather than remain arched. This condition is also called pes planus or fallen arches. This can be extremely painful for some people, while others are able to live a relatively normal life with some corrective footwear to ensure greater comfort. The degree of severity of the condition typically indicates whether or not someone who has flat feet can serve in the military. This is usually decided by a doctor who examines new recruits for the military and decides on whether or not someone is fit to serve. The military regulations in the US specifically indicate that a person with flat feet does not meet the standards of physical requirements to serve in the military in two basic instances. If someone has “symptomatic” flat feet, which means that the condition causes the person persistent and severe physical pain, then he or she cannot serve. The actual process of a person’s arches falling can be the only time of severe pain for a person with flat feet, and if the person does not experience pain afterward, then he or she can join the military. Ongoing pain, however, will typically prevent a person from service in the US military. There is a second stipulation that can prevent someone from having flat feet in the military, which is if a person needs to wear corrective footwear. This stipulation can have some leeway to it, and someone who wears basic inserts may be able to serve, but prescriptive or orthopedic footwear will typically keep someone out of the military. These regulations are in place because someone with flat feet may be more prone to developing other foot or leg problems, especially during the grueling marches that are often part of basic training. 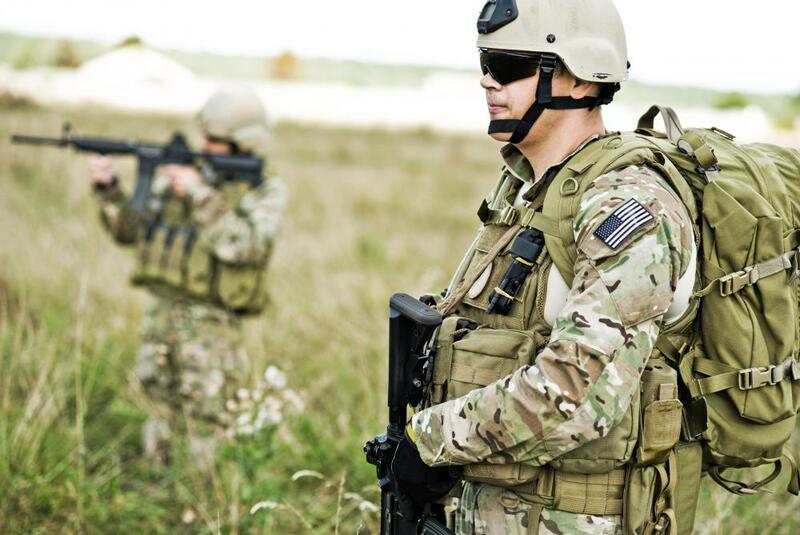 Special footwear can also be difficult to maintain on the battlefield, and most military agencies will not recruit someone who may become a liability in a combat situation. Since having flat feet can keep someone out of the military, it has often been used as a way to avoid service by those who did not wish to join. What Does "Hooah!" Stand for? What are the Best Tips for Running with Flat Feet? What Are the Best Exercises for Flat Feet? What can I Expect from Surgery for Flat Feet? What Should I Look for in Shoes for Flat Feet? How do I Choose the Best Women's Running Shoes? I am a former Vietnam era Army with 2 tours in the infantry. I attended OCS, Airborne school, Ranger school and Pathfinder school and left the service as a Captain. I have over 60 jumps can't tell you how many miles walking and running. I was born with flat feet like my father and grandfather before me and my son now. They must have let me slide, Not. I had to take physicals for everything and no doctor even mentioned my flat feet. I am now over 70 and it doesn't give me any issues other than just old age. Almost everyone in my family has flat feet, including my father and grandfather, who both served in the military (in Europe). My sons all have flat feet as well, no other foot/mobility issues at all, my oldest son serves in the US military. My husband, with high arches, has had several foot surgeries because of bone spurs due to his high arches. I initially got accepted for an ROTC Scholarship in 2006. A few weeks later I then got a letter in the mail stating I was now being denied for my flat feet. I did wear corrective shoes at the time, but didn't even think it would be a problem since my scholarship was based off my athletic accolades. I'm in the US Army Infantry. My arches fell 15 years ago and I have had arch, heel, shin and knee pain. Road marching kills me. I was told no in 1991 due to flat feet after my second exam by a US entrance exam physician. I am very upset even after all these years that they would not accept me. Since then, I have lost the paper that showed the disqualification so my kids will not think I am making this up. Although, I have blown three ACL's since 1991 due to sports related injuries. I have pes planus and served eight years in the Marines. Prior to joining, I had no problems with the condition. The issues started once I left. The positive about this is that I am being compensated for flat feet by the VA. Like the article says, I guess it depends on the severity of things. @anamur-- I'm not sure, you should speak to an expert about it. My opinion is that you will not be accepted because military personnel have to wear the equipment provided for them by the military. This equipment, including shoes, is manufactured especially for men and women who are serving. It's meant to protect them and provide utmost comfort in the environment they will be required to serve in. Military personnel cannot wear personal shoes on the field. Like the article said, there might be some exceptions made for insoles for flat feet, as long as the insoles can be used with the shoes provided to them by the military. But I highly doubt that such an exception can be made for shoes. You might want to ask around to make sure though. If someone has to wear special flat feet shoes, can they serve in the military? My brother thought that he would not be able to join the military because of his flat feet. But he applied and during his physical examination and interview, they determined that his condition would not prevent him from physical activity and he was accepted. So it completely depends on whether flat feet result in pain while walking, running and other exercises. If it does not, than it will probably be okay. I have flat feet but am otherwise healthy, and would like to join the U.S. Marines. Does anyone know if there is a permanent treatment for flat feet? Is there a way I can fix my feet so that I can join? My uncle was unable to serve in WWII because he was flat footed. When we were kids and he used to tell us this, I don't think anyone believed him. It always sounded like a yarn! The truth is, he really suffered with his feet and did have to wear special shoes with custom insoles. I still feel bad that we doubted his story!